Not too many people put much importance on the 17th of May each year, for them it is just another spring day. In Norway the 17th holds a special meaning for the people. On that day two hundred years ago, Norway signed its own constitution declaring it a separate kingdom in order to prevent it from being ceded to Sweden following the Napoleonic War. This did not work out as planned, as after the war Sweden began hostilities towards Norway denying their independence and forcing them into a loose union. Norway was able to keep their constitution so long as it was amended to maintain the union. Despite not being completely independent, the Norwegian people began celebrating this day, however it as mostly students celebrating it, as the Swedish and Norwegian governments were afraid to allow it as it could be seen as revolt, and actually banned its celebration in the 1820's, however this was ended after the Battle of the Square in 1829 after conflict between those celebrating and soldiers lead to outrage from the public. After the lifting of the ban, the day became much more popular, leading to the inclusion of addresses as well as parades. One misconception that I had heard about the 17th of may, is that it is to celebrate the liberation of Europe after the surrender of the Nazis in World War Two, while the dates are close, the war ending on may 9th. Today, it is to celebrate the constitution, as well as the royal family. There are many fun things to do during the day including the parades as well as a carnival. The parades are different here than back home, because there is not just one parade, but several during the course of the day. Another interesting difference is that the parades focus less on military, and more on the community, the most popular parade being the children's parade. Even more so, there is the the citizen's parade, which includes clubs and student groups from around the town. I was excited to actually be invited to join in this parade. It had been quite some time since I was in a parade, and I had forgotten how much fun it was. the people here were very welcoming to our group, and we were encouraged to wave our flags and shout "Hurrah" as we as "Gratulerer med Dagen" which means congratulations on the day. It was also great to see people dressed in the traditional clothes of Norway called Bunad. Wait...that's Mjolnir armor, Norse name, but not Norse clothing. 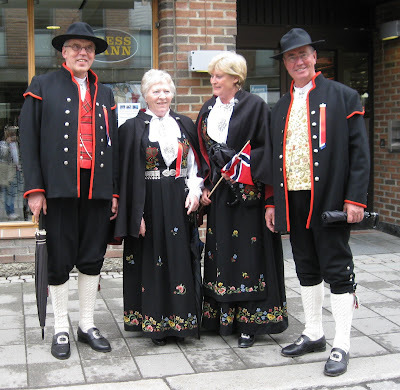 This is what the Norwegian Traditional dress looks like, Bunad is a term that covers both men and women's clothing. While the women's dress is very common to see, it was Mostly older men whom I saw wearing Bunad. There is also the question of what are traditional foods to eat during the day, and I was surprised the find out that it is not very different from what we would eat for the fourth of July. 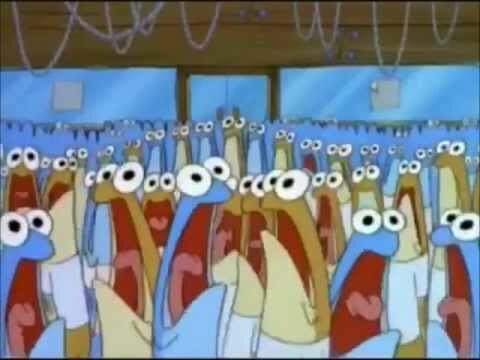 There were incredibly large lines of people queuing just to get either a hot dog or some ice cream. Which on a side note, they have bacon wrapped hot dogs here, how they beat us to this technology is beyond me, but they are amazing and I will miss them once I go home. Once the festivities died down, I returned home to relax for a few hours before heading over to a friends apartment for a party to wind down the day, which was great as we had a front row seat out their kitchen windows of a fireworks display. It was amazing to experience another Country's independence day, as it gave me insight into how a country's past can influence how they celebrate their freedom. Well, I was that for this post that I was going to have beautiful pictures of my camping trip, however the weather here was less than favorable so we had to postpone our trip. So once again I figured that I would talk about more smaller things that would not merit their own posts themselves. One of the many questions that I have been asked in my time here is how I even manage using the imperial system of measurement as an Engineer. This ranks up there with "Isn't there a lot of Norwegians in Minnesota?" I find it rather funny, because it always comes up when we are talking about drinks and I say something is in ounces, and whomever I am talking to just looks at me confused. I then have to give a crash course in how we use the system, and the arbitrary means in which things are measured. Being an engineer I much prefer the metric system to the imperial system as it is far less arbitrary when converting between the sizes of something. Yet despite my years of experience with it, I am still baffled when it comes to cooking. I have found it rather hard to make food that my parents have sent from home when the instructions say to add 3 cups of water, and all my measuring tools are in deciliters. While the unit conversion app on my phone has become my best friend, it is still rather hard to measure out 8.357 deciliters accurately. I still have about six cups of soup sitting in my fridge from that mistake. One of the fun things about studying abroad, is not only experiencing the culture of the country you are in, but also that of the other students who are studying abroad as well. I have only met about 3 other students from the US here, one being from Florida, and the other two being from the University of Minnesota. (.6 seconds has become a swear word between us after the UND-Gopher game) What suprised me the most was how many exchange students here are from Eastern Europe. One of my good friends and neighbors is from Lithuania, and another friend is from the Czech Republic. There are also several others studying here who are from South Korea. While UND has a very large population of Exchange students, most of the ones I have met have either been from China or Norway. With such are diverse group of friends, I have been able to sample several different dishes from Norway and beyond. It is always a good time, sampling different foods, as well as learning more about different countries. There are several student villages spread out across the South East of Trondheim, the two that most international students are recommended to live in are Steinen and Moholt. Each one has its pros and cons. Moholt is by far the more popular option, as it is closest to campus and has more events going on. However because of these events, it can be quite noisy in some rooms as the events usually take place in the basements of the apartments. Steinen is much quieter, and has two different areas for students to stay in, the apartment block, or the student houses. I chose to live in the house, as it has a bit more space in the rooms and is much quieter than Moholt. However the one drawback to Steinen is it is farthest from campus. However this not as much of a drawback due to the wonderful bus system that Trondheim has. When I first got here I was hesitant to use the buses, as it cost 50 kroner, about $8.50, for each time you use the bus. However you can purchase a T-kort which you add money to at a discounted price. I received a crash course on the transit system within my first week here, I had taken the bus to Ikea in order to purchase sheets and a pillow for my bed, and unfamiliar with the stops I ended up taking the bus to the end of the line, Which was about 5 miles outside of town. Not having my T-kort at the time I had used the last of the money I had on me to purchase my fare, leaving me stranded outside of town with no money and no way of getting more, as there was not an ATM near the bus stop. Luckily it was warm out, and I got a nice little hike through the outskirts of town until I found a shopping center with an ATM and was lucky enough to catch the last bus into town. I was much more attentive after that, as much fun as being lost in Trondheim after dark is. Probably the weirdest thing that about classes in Norway is that final exams do not take place until the last week of may, yet classes are over the first week of April. When I first noticed this I didn't know what to think, being so used to having classes up until the final, I didn't know what to do with all the free time. However I can see how it is welcome seeing as the finals here are usually worth all of the grade you will receive for the class. Another major difference as there are no tests or quizzes in the class that contribute towards your final grade. I will have to wait until after I take my exams before I can make a decision as to which system I prefer. Now that things are starting to warm up here, I am hoping to try and make some hiking trips into the hills around town, as well as venture out of the Trondheim area. I was invited on a car trip the first week of may to the Lofoten area which I am looking forward to as I have spent all of my time here in Trondheim. I was hoping today that I would be able to blog about a wonderful hiking trip I was planning on taking today, however I was unable to make that trip. I had planned to take the bus into town in order to catch the only ferry leaving in the morning at 12, however early Sunday morning was daylight savings, and my alarm clock did not change over. This caused me to be an hour late, and despite my best efforts to get to the pier, the ferry was already leaving as I made it. So without the subject I was hoping to talk about, I figured I would use this post to talk about a few smaller things that alone would not really merit their own post. One thing that I enjoyed doing back home was going and seeing movies, and luckily they are not too much more expensive, The concessions are even cheaper! I have seen three movies during my time in Trondheim, the first was when one of my friends tricked me into seeing Paranormal Activity: the Marked Ones, I was upset because I was told that we were seeing the Hobbit. A few weeks later I went and saw 47 Ronin. The last movie that I have saw was the LEGO Movie. It wasn't until I saw the LEGO Movie that I realized a distinct difference in movie experiences here. When a movie comes to Norway, depending on what the target audiences age is, it will either be subttitled or it will be dubbed in Norwegian. If it is an adult movie in most cases it will only be subtitled in Norwegian, as most adults can understand English. If it is a children's movie like the LEGO Movie, then it will be dubbed in Norwegian so the the kids can understand it. This presented me with a fun listening exercise. I must add that it is very weird when Will Ferrel comes on screen and starts speaking fluent Norwegian, especially when the words do not match up with his lips. Overall though it is still a pleasant experience and I found myself able to understand most of the dialogue. I feel bad that I was unable to make it on my hiking trip, however towards the end of our spring break I am planning on taking a hiking trip, so I will be sure to take several photos and have much more to talk about. While there are many great vantage points in Trondheim, One of the best places to get a good view of the city is definitely the Tyholt Tower. Located on the Tyholt Campus, the tower is 124 meters high, complete with a rotating restaurant. One of my fellow international friend's birthdays was a few weeks ago, and to celebrate we decided to go to the pizza buffet to celebrate. This was a welcome idea as being able to eat as much pizza as I wanted for only 120 kr was a welcome idea. The tower is only a short walk from the Moholt, and is very hard to miss. This is nice, because it makes it easier to navigate the town using it to find your bearings. Once we were seated, I immediately took my camera out to take photos of the area, and I was not disappointing in what I was able to see. I have to say that these are some of my favorite photos that I have taken. It seams that everyday I am reminded how beautiful this country is, and it is making me anxious to get out and explore the countryside even more. I have been planning a hiking trip for Easter vacation that I a looking forward to. One thing that has been interesting here in Norway has been the weather. I have been constantly told that this is one of weirdest winters Trondheim has had in many years. Since I have gotten here, it has only snowed once. (A complete 180 from what it was like in Grand Forks before I left) It has also been relatively warm here as well, with temperatures staying above freezing for most of my time here. The past week has seen a lot of rain, it rained all day just a few days ago. However, it was a welcome sight after seeing some of the snow storms back home before I left. I'm really looking forward to when things warm up even more and I can start doing some hiking day trips. One of the first lessons I learned in Grand Fork, was that you do not go to Target when you see busses outside. Unless you are brave enough to face down the swarms of Canadians that have come down in order to purchase cheaper goods in the US. However, upon arriving in Trondheim, one of the first things I realized is how much more things can be here. for most things it isn't that much worse. Fish here is relatively inexpensive at the stores, but if you had a beef intensive diet before, prepare to become vegetarian. Since Norway doesn't have as much cattle as the US, it costs much more here. An 8oz steak can cost close to 30 dollars in most stores. One of the biggest habits for me to break here is going to be eating out, as a meal at a sit down restaurant can cost upwards of fifty dollars if not more. After getting over the shock of some of the prices, I picked myself up out of the fetal position and scheduled to take one of the free buses to Sweden. They leave everyday from the city center, and it is about a four hour round trip with an hour at the store to make your purchases. It was a welcome relief when I saw the prices upon arrival, while several items were still more expensive then their counterparts back home, the costs were much more manageable. The bus ride there was very enjoyable, and I took several photos of the mountains on the way there. The scenery here is nothing like North Dakota, or Minnesota for that matter. It reminded me more of driving through the mountains in Colorado. The photos didn't turn out as well as I had hoped, as I was taking them from a bus window driving down a highway. Once things warm up a bit more here I definitely want to take a hiking trip so that I can take more photos of the gorgeous scenery here in Trondheim. Copenhagen was also delayed? Well it was. Crap. Now Time (being the fickle mistress it is), was against me as well. days worth of clothes and toiletries for just such an event. get to check in to my housing and explore a bit. vicious Kung Fu kick to the shins it would make Bruce Lee blush. sleep on, I was able to attend a few of the orientation events being held. still had a ton of fun competing and getting comfortable with our classmates. how much of the stars you can see despite all the lights in town. took most of my picures. Hovedbygningen, and reminded me of Hogwart’s. existential thinking…or maybe I'm still sleep deprived from the time change. feeling more comfortable in my surroundings I turned in for the night. Murphy AKA Voldemort will certainly pop up again. will be ups and downs for sure, but in the end isn’t that what an adventure is?